On Saturday, December 5th 2009 the Masons of Texas selected for the office of Right Worshipful Grand Junior Warden a seasoned, committed and dedicated laborer in the quarries of Freemasonry. 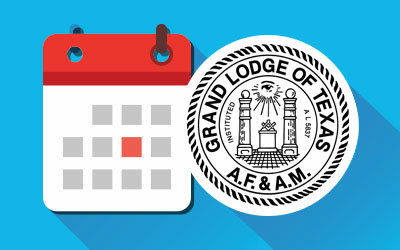 Each succeeding year, he scaled the fraternal ladder of leadership which again brought him reverently before the Holy Altar of Freemasonry on Saturday, December 8, 2012, there to obligate himself to the Masons of Texas as their Grand Master for the 2012-2013 Grand Lodge year. The third child born to Frances Marcel Williams Rogers and Woodrow Wilson Rogers, Walter W. Rogers was born on August 18, 1944 in Houston, Texas. He had one brother and one sister. When Walt was only one year of age, his mother and father divorced, and his mother remarried Clarence Thomas Little, who while serving aboard the battleship Maryland was a Pearl Harbor survivor and Purple Heart recipient. Two more children, a boy and girl were born in this marriage. Walt’s formal education began at Santa Rosa, Texas and continued through the fourth grade. Then his family moved to Bryan, Texas where his schooling continued through the sixth grade before the family moved to Houston where he attended the Galena Park schools. At age 17, Walt joined the United States Navy in 1961 and served aboard the USS Oak Hill LSD-7 as an Electrician’s Mate, Third Class. While serving in the Navy, he took college courses and was honorably discharged. On January 17th, 1969 he married Ardith Elaine Smith who soon thereafter was employed by the First State Bank of Bedias, later being employed by the Texas Department of Criminal Justice until her retirement in 2007. Walt and Ardith had four wonderful daughters: Rebecca Elaine Morris, Gail Linden Williams, Shauna Denise Jenkins, and Kristy Dawn Carroll. Walt and “Miss Ardith” are the proud grandparents of seven grandchildren. 2001-2003 and again from 2007 through 2010. In recognition of Walt’s many contributions to his Lodge, his community and to Freemasonry, he was awarded the Golden Trowel in 2003. His concern for maintaining accuracy of the rituals of freemasonry led him to earn and maintain his “A” Certificate of Proficiency since 1979. Walt is an endowed member of Bedias Lodge No. 651 in Bedias, Planters Lodge No. 147 in Plantersville, Park Place Lodge No. 1172 in Houston, Tranquility Lodge no. 2000 and a plural member of Point Isabel Lodge No. 33 in Port Isabel, Texas and also a member of South McAlester Lodge No. 96 in McAlester, OK.
Walt’s service to Grand Lodge began with his appointment by Grand Master J.M. “Jimmy” Willson, Jr. as District Deputy Grand Master in District No. 29 for the 1981-1982 Grand Lodge year. Additionally, he has served as Assistant State Coordinator under Grand Master J.D. “Buddy” Baccus in 1983, Grand Master George R. “Bob” Scott in 1985, and under Grand Master John E. “Jack” Kelly in 1987, and as State Coordinator under Grand Master Leonard. P. Harvey in 1989 and Grand Master W.M. “Mike” Gower in 1999. 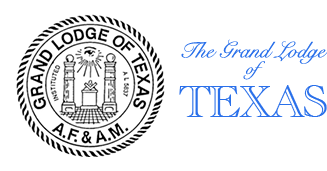 Additional service to Texas Masonry has included: Chairman, Special Assignments Committee 1986-1988, member of Committee on Work 1988-1991, Purposes and Policies Committee 2000-2006, Chairman of the Take Time to Read Committee 2001-2004, and Vice Chairman 2007-2009. 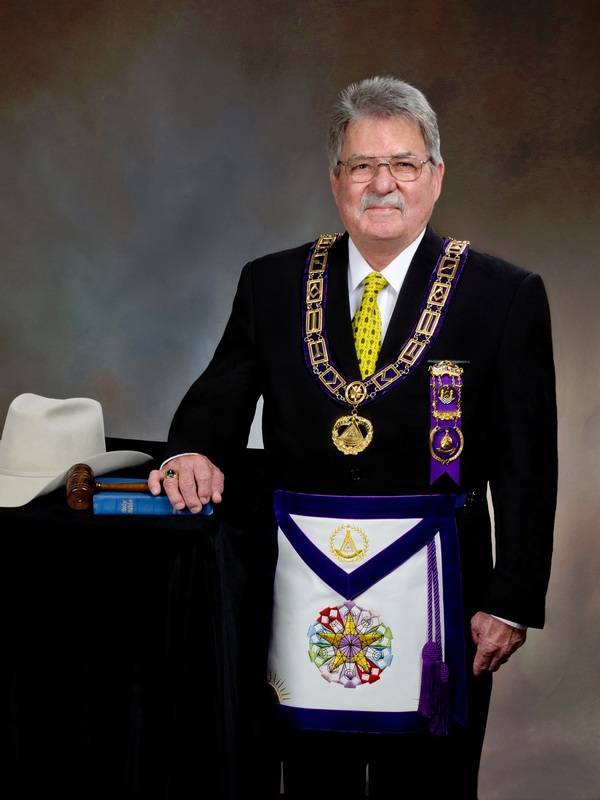 He served as Grand Junior Deacon in 1985, Grand Senior Deacon in 1999 and Grand Orator in 2002, as has been Grand Representative of the Grand Lodge of Connecticut since 1985 and was appointed Grand Representative of the Grand Lodge of Missouri in 2010. He was awarded the William M. Beck Award in 1999 and is a member of the Grand Lodge Library and Museum Sam Houston Hall of Fame. In 2012, our Grand Master was elected Chairman of the conference of Grand Masters of North America for the conference to be held in Kansas City in February of 2013. Walt Rogers is not a man content to look across a river and wonder what is on the other side. He wants to cross the river and see for himself. So, in 1979 he received the 32nd degree in Houston, in 1985 was honored by the Supreme Council of the Ancient and Accepted Scottish Rite of Freemasonry by his investiture of the Rank and Decoration of Knight Commander of the Court of Honor and in 1997 was coroneted a 33rd Degree Inspector General Honorary. His activities in the York Rite of Freemasonry includes membership in the W.T. Austin Chapter No. 87, Royal Arch Masons and the W.T. Austin Council No. 52, Royal and Select Masters and he is a Past Commander of Ivanhoe Commandery, Knights Templar No. 8. He is a member of Madisonville Chapter No. 193, Order of Eastern Star, and is a Past Patron of Madisonville Chapter. He has served as President of the Masters, Wardens and Secretaries Association of Masonic District No. 29 in 1983. As a Knight Companion of the Red Cross of Constantine, Walt is a Past Puissant Sovereign of DeMolay Conclave in Waco and held dual membership in Ascension Conclave in Tyler from 2001 until 2008. Other Masonic affiliations include charter membership in W.M. Taylor Chapter of the Philalathes Society, Chinar Grotto and Arabia Shrine in Houston. He is a member of the Texas Lodge of Research, Scottish Rite Research Society, the Societas Rosicruciana in Civiatibus Foederatis and the Star Chamber Council No. 298, Allied Masonic Degrees in Tyler, and Southeast Texas York Rite College No. 90 and is a Member in Perpetuity (MIP), National Sojourners Brazos Valley Chapter No. 378 in College Station, Texas. Walter W. Rogers – a man who does more than set goals. He attains his goals!